Freemasonry is known as the oldest fraternal organization known to man. It is also a prerequisite to becoming a Shriner. By starting your journey at this level, you get the opportunity to follow in the footsteps of great men, including our most famous Mason, President George Washington. Masonry also provides a man with the working tools to better himself and those around him. 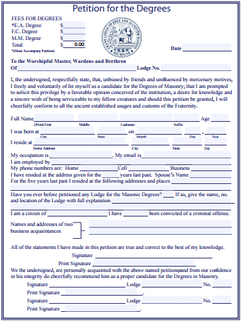 To start your journey, download the petition below, then search out a Mason and inform him of your interest in Masonry. Upon receiving your Master Mason degree, you become eligible to become a Shriner. As a Shriner, you become an owner of one of the most amazing philanthropic entities every created - Shriners Hospitals for Children. Aside from being an owner, you will also become a member of a fraternal organization that puts having fun second only to helping the kids. Become a Shrine Clown and you get to act like a kid again. Want to wear a kilt and learn to play the bagpipes - the Highlanders are for you. From motorcylces to mini-cars to marching in parades, there is always something to keep you entertained. Download the petition below and get it to the Recorder to join!